Fiction – paperback; Penguin Modern Classics; 128 pages; 2006. Oooh, my goodness, the late Muriel Spark did a fine line in totally batty, off-the-wall characters, didn’t she? 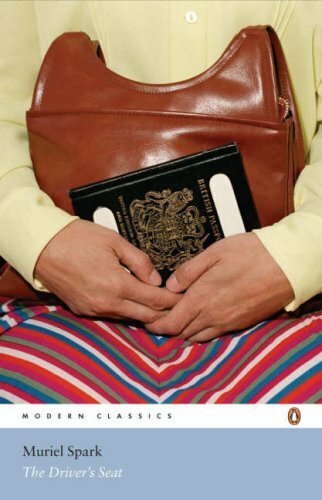 In this novella, first published in 1970 (and recently long-listed for the the Lost Man Booker Prize), she introduces us to the 30-something Lise, who escapes her boring office job for a holiday to “the South”. Except this is no ordinary holiday — and Lise is no ordinary office worker. From the outset she behaves in inexplicable ways. When she throws a complete strop in a clothes shop for what seems like a very odd reason indeed — she didn’t like knowing that the dress she wanted to buy was made from stain-resistant material — the reader immediately wonders whether Lise is highly strung or simply a bit weird. When she returns to the office and begins to laugh hysterically and then starts “crying all in a flood” you think maybe she’s just hormonal. The colours go together perfectly. People here in the North are ignorant of colours. Conservative; old-fashioned. If only you knew! These colours are a natural blend for me. Absolutely natural. Oh yes, Lise is a nutter. And you just know her trip to the Continent is going to be filled with one narrow escapade after another. And this is where I break one of my reviewing rules and reveal a plot spoiler, so if you don’t wish to know what happens next, can I suggest you skip ahead to the very last paragraph. Right-o. So, immediately, the tension gets ratcheted up a few notches because you want to know how Lise meets her sorry demise. And so you follow her shenanigans with a weird mix of fear and fascination, because even though she’s a screwball character you don’t want her to die. And that, I suppose, is the magic of this wonderful book. It’s only 107 pages long and easily read in one sitting, but it is such a masterpiece of plotting and suspense that you wonder how Spark achieved it in so few a words. Everything is pared down to the bare minimum without losing that sense of excitement and sheer horror as Lise bumbles her way through the streets of an unnamed European city. The Driver’s Seat is terribly dark fodder, but I loved every moment. I don’t think it will win the Lost Booker, if only because it’s so short and is over before you’ve even begun it, but it’s definitely a book that demands a second or third reading to see if you can discover exactly how Lise plotted her journey of self-destruction. I wonder whether its slightness will indeed prevent the novella from winning the Lost Man Booker; I think it is meaty and dark enough to hold the mantle of winner. I loved the sexual politics; think it is deserving of many rereadings (it’s been about three years since my last); love twisted Spark as much as I do quirky and funny. Maybe I’m biased, but I want Patrick White’s Vivisector to win — that’s a truly ambitious novel, quite dark and meaty, too. But I do love this Spark: it *so* wasn’t what I expected when I started reading it. Oh I do hope it wins, though in terms of length I guess that could be its downfall. Its not the winning its the taking part or some such. Definitley a book that needs to be re-read and on I will definitley buy in 2011 when I am once more allowed as this book has to be on my shelves. It had a Du Maurier darkness which I am a huge fan of (not saying she was ripping her off) I am going to try and read the Susan Hill one soon enough. I think the fact that Spark does fit so much in to such a small package makes it a come from behind contender for the Lost Booker. I’d like to re-read The Driver’s Seat. I have loved nearly everything I’ve read of Spark. I really like her little trick of telling you what will happen to people early on. It should spoil things but somehow it leaves you guessing even more about why. Why why why!! Glad you enjoyed this one! I’m really going to have to read some Du Maurier, aren’t I? From the Lost Booker I’ve read Nina Bawden’s Birds on the Trees, reviewed last week, and Patrick White’s The Vivisector, reviewed a couple of years back. Out of all three, Patrick White’s book is definitely my favourite. This one is definitely worth a re-read. I’ve only read three of Spark’s novels, but I’ve loved every one. And it’s great to know she’s got such an extensive back catalogue because it means I can go on enjoying her work in the years to come. I have got to buy this one from all the positive things I’ve read from you and Simon. I’d like to know who the author of this review is. I need it! Can anybody help me?? Justyna, if you check the about page you will find the name of the author of all the reviews/posts on this blog. May I ask why you need it?